The Real Madrid vice-president Eduardo Fernández de Blas appears to have confirmed Rafael Benítez’s arrival as the club’s new head coach with an offhand comment. Benítez is widely expected to replace the departed Carlo Ancelotti after confirming that Sunday’s match against Lazio will be his last as Napoli coach. De Blas, speaking at a club event on Saturday evening, gave the game away as he praised the outgoing Ancelotti. The Madrid-born Benítez has a glittering résumé, having led Valencia to two Primera División titles and a Uefa Cup crown. He also steered Liverpool to Champions League glory in 2005, when his team staged a major comeback in the final to stun an Ancelotti-led Milan. 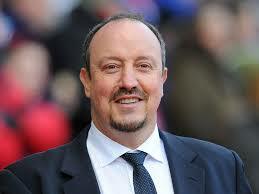 Benítez also won the FA Cup and Uefa Super Cup while at Liverpool.